Twenty one of the Wimmera–Mallee wetlands received environmental water in 2014–15, including seven wetlands in the North Central region, 10 wetlands in the Wimmera region and four wetlands in the Mallee. Fewer wetlands received environmental water in 2014–15 than in 2013–14, for a variety of reasons, largely based on previous watering history and environmental need. Across the system, many of the wetlands received water in autumn 2014 which meant that water requirements in early 2014–15 were reduced. 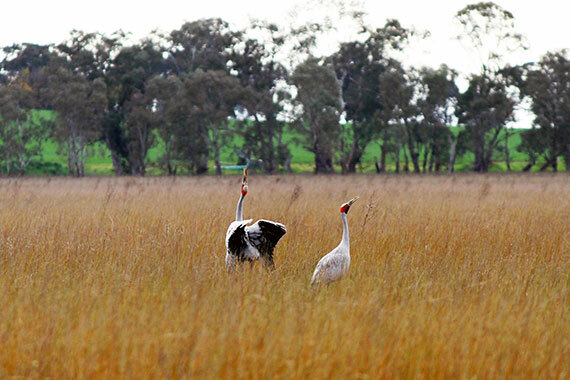 Environmental watering in the Wimmera–Mallee wetlands in 2014–15 aimed to provide suitable aquatic habitat to support waterbirds, provide watering points for fauna, and improve the condition of riparian native vegetation. One of the most exciting results of 2014–15 was the sighting of a brolga at Jesse Swamp Dam in the North-Central region. This followed a successful watering of the dam and some of the surrounding wetland. Other monitoring results throughout the wetlands included the sightings of several species of waterbirds, vegetation growth and a large boost in frogs after each watering. An Environmental Water Advisory Group for the Wimmera–Mallee wetlands was formed in 2014–15. This group will assist in developing watering priorities and to provide knowledge and local perspectives on environmental watering and communication activities. To get involved or find out more contact the North Central Catchment Management Authority or call 03 5448 7124. If you are outside this region but want to get involved in the Victorian environmental watering program go to your nearest region and contact the catchment management authority or relevant water manager.